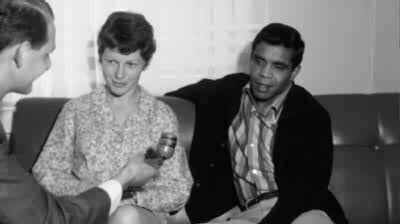 In 1968, Aboriginal boxer Lionel Rose became the the first Indigenous world bantamweight boxing champion when after 15 rounds he defeated Fighting Harada in Tokyo. He returned home to a hero's welcome by a crowd of 250,000. Lionel is a very lucid documentary which tells Lionel Rose's story from his childhood in rural Victoria to the present day. It's a story that's both triumphant and rather bitter-sweet, because after his success and fame in the 1960s Rose found it difficult to adjust to a more normal life. Four years after winning his crown, Rose lost his title to Ruben Olivares. He became tangled with the law and spent all his winnings on family, gambling and drugs. His marriage to Jenny, the daughter of his first trainer, Frank Oakes, broke up for a while. Combining vibrant long-lost archival material, modern day footage and candid interviews, Lionel is a biopic about an often-forgotten Australian champion who took on the world against all odds and won. His success came just months after the passing of the 1967 Australian referendum, which saw Aboriginal people counted in the census for the first time and allowed the government to make laws for them. In this climate, Rose was more than a black sporting hero - he was also a symbolic figure in the interracial politics of the time. Young Lionel with his wife Jenny being interviewed. A mixed-race marriage at that time was a bold move because it challenged accepted standards of white and black society. Eddie Martin was initially commissioned by SBS to deliver a 52 minute documentary, but became interested in also doing a longer version after finding it impossible to squeeze all the important events of Lionel Rose's life into that time. Lionel demonstrates as well how Lionel's astonishing celebrity and marriage to a white woman represented a breakthrough in the public's acceptance of Indigenous people. The 52 minute version was broadcasted on television, the longer version is the movie and DVD version. Lionel Rose was born on 21 June 1948. He became the first Aboriginal Australian of the Year. Lionel's recording career delivered two hit singles, one of which was written by Johnny Young.